Installation of the EZ Wand Remote controlled blinds( Easy Wand ) does not require any special tools or the need to hire someone to come into your home to install. Everything you need is in the Box! LIMTED TIME - Enter NOW for a chance to Win Your Own EZ Wand ( Easy Wand ) Automated blinds! Only a few minutes to install. Fraction of the cost of more expensive alternatives. Can expand up to 8 units with 1 remote. Only cost of 6 AAA Batteries. Looks like the original wand and non-bulky. Use AAA Battery, Solar or Power Adapter. Whether you're planning on making improvements to your home or office space, you might want to know the benefits of having motorized blinds. 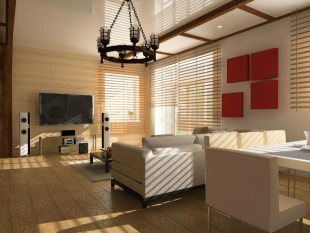 EZ Wand ( Easy Wand ) Remote controlled blinds is an affordable and cost effective luxury that provides you with added convenience. At the push of a button on the EZ Wand ( Easy Wand ) remote, adjusting your blinds open or closed is a snap. You don't have to move away from where you are seated or comfortably laying down to close the blinds if the sun gets too bright. 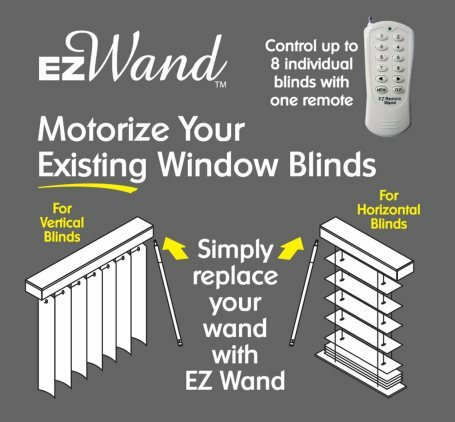 You save yourself time and effort when you have EZ Wand ( Easy Want ) automatic blinds. EZ Wand ( Easy Wand ) can also provide you with the benefit of security. If you want to keep your home or office hidden from view in a particular time of the day, you can easily close the blinds with EZ Wand ( Easy Wand ). 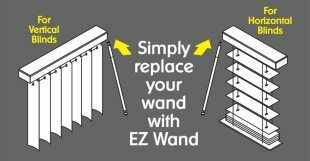 Or if you want to let the sun shine in and show that your home or office is not vacant, EZ Wand ( Easy Wand ) allows up to 8 blinds to be adjusted at one time. Simple. Affordable. Convenient. EZ Wand ( Easy Wand ).